Okay, so Sega isn't really creating an instalment in Nintendo's happiest franchise Animal Crossing, but the blue and white company did create a safe hedgehog crossing point in London to promote this Friday's release of Sonic Colours for Wii and DS. With 50,000 hedgehogs a year lacking the speed to cross British roads safely, Sega dedicated a stretch of London asphalt to educating the country about the endangered animals. With a blue walkway and dedicated lollipop person (that's a "crossing guard") to stop traffic, Sega hopes to get the word out about its latest hedgehog outing in this most unusual way. 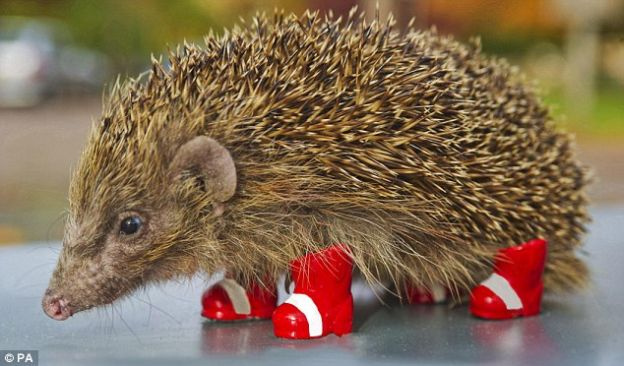 The best news is that we all get to benefit by looking at a photo of a real hedgehog wearing Sonic's iconic red shoes. Darnit! That fooled me for a sec! I love this promotion. Very well done. Hope the hedgehogs will benefit permanently though. They're too awesome to be ignored. Finally, SEGA get's it's stuff done. Now I need to get Sonic Colors... ERGH... MUST RESIST... NAWRP! I'll buy one ASAP. DANGIT! Where abouts in London is this? If it's close enough I may pay them a visit. I had a hedgehog for a pet. They're the sweetest things you could imagine. I'm glad Sega is doing this. Only two "plot holes." 1. Couldn't the hedgehogs cross at other places? and 2. How is this supposed to promote Sonic Colors? What Hedgehogs aren't actually fast! I don't know who thought of this, but it is one cool publicity campaign! In germany we have a lot of tunnels under streets for wandering animals like frogs,hedgehogs and so on. And now is the time were a lot of weak or ill hedgehogs are found so a lot people have some in there basements and help them to survive the winter and let them go in the spring again. Hahahahahahahaha! I love this! What an interesting ad campaign! @Nintendo-64 wait, so people catch hedgehogs and give them shelter in Germany? Or do the hedgehogs run for shelter at residents home? That's sweet. I don't think I quite understand any of this. Can someone help? So Sega is paying a person to walk hedgehogs safely through a highway? How permanent is this? Will anyone even see the crossing guard while going 70MPH? This might cause a bad accident. Shouldn't they have funded a passageway for the hedgehogs instead? 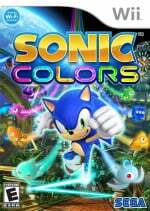 And how does this promote Sonic Colors? Haha I like how random this ad campaign is! But its for a good cause, so win-win. reminds me of sonic a bit. Usually, these crossings allow the animals to cross underneath the road, and by the lollipop, I presume it will be a general road sign, Animal Crossing (hey I did it too)! Compared to Sonic, other hedgehogs are too slooooow! It was nice of Sega to help out those real hedgehogs. @Caliko Of course the hedgehogs wont be caught just if someone see one running across their gardens or in the forests. It is just allowed if you find baby hedgehogs without their parents or if you find very skinny or sick ones. Then you can bring them home. Person 1: "What? there's a hedgehog in my backyard!" Person 2: "Go and exterminate it, then! Don't just stand there gaping!" Person 1: "Okay okay. Here little hedgehog, come to daddy!Lemme pick you up and move you to another-OWWWWWWWWW WHAT THE @@@@ IN THE @@%#&$ WAS THAT OWWW I PRICKED MYSELF OWW @@#%@ @@%#@ @@@&#^@!!!!!!!!!!!!!!!!!!!!!!!!!!!!!!!!!!!!" yeah where is this crossing? I'd like to Sega to bring out a blue controller PLEASE!! Hopefully, but doubtfully, this will continue after Sonic Colors. This is the strangest "good cause" I have ever heard of. "It may be possible in 10 years"